Here’s your gentrification-eviction-displacement electro theme song. Let’s dance. In-our-face drag performer Persia has teamed up with phantasmic trio Daddies Plastik to create an ecstatic dance punk anthem for our insane SF economic times, “Google Google Apps Apps.” It’s really catchy! Gentrify me, gentrify me, gentrify my love. And it all comes from personal experience. It all began a few weeks ago, when I received an invite via facebook to “Save Esta Noche,” the only gay Latino bar in SF (where I perform every Saturday at 7pm and 11:30pm with Mitzy Lee, Vicky Jimenez and Lulu). Apparently the bar was in trouble, they had lapsed on some of their bills and the bar was on the verge of closing. Upon reading the invite, I realized that none of the Esta Noche performers were on the bill, so I made a few phone calls and put in my two cents. I was directed to the offices of David Campos, whose staff was behind organizing the event. I informed them that I found it appalling that there were no Esta Noche performers on the bill. They informed me that everything was done last minute and they were not able to contact us but they were very grateful that I called and wanted us. So, Lulu and Mitzy Lee and myself, were added to the bill. All while getting ready to be un-employed from my current job, SFMOMA, when it closes for remodeling. Facing unemployed from possibly two places had me on edge. My stress level was at a maximum. However, it wasn’t until I saw my friends perform at the Eagle, Daddies Plastik (San Cha, Vain Hein, Tyler Holmes), that it dawned on me, “I should write a song, and have my friends help me.” Lately, the Black Glitter Collective (a group of artists and homies I’m in) have all been facing troubling life events; from couch surfing to having problems with our landlords, to losing jobs, having work hours cuts, moving to the East Bay, etc. So, as Daddies Plastik performed their last song, I wrote down lyrics on my phone. I wanted the song to be silly and in your face. Two days later I went to Daddies Plastik’s home in West Oakland. They came up with a hawt tune, we structured my ideas in pop-music format and on May 18th we performed it live at Esta Noche, for their benefit. Then last night, we took the song to our producer Keith Tadashi Kubota aka I.VII.I.IX. and he worked his magic. We, Daddies Plastik and I, will continue to collaborate. This summer we’ll be working on an EP, along the same lines as Google Google Apps Apps. Together, alongside the Black Glitter Collective, we’ll be working on music videos and other projects. From the San Francisco Bay Guardian. Let’s stop blaming the hipsters. The Google bus, that annoying icon of yuppie invasion and transit privatization, is not the lead driver of gentrification’s reckless stampede reshaping our city (though it does play a role). The upscale restaurants dominating commercial strips may be economically and aesthetically offensive to many, but they are the natural byproducts of gentrification’s much-ignored elephant in the room: the real estate industry. While headlines, comment threads, and café chatter fixate on the tech industry and yuppies with fistfuls of dollars, it’s the profit-gobbling real estate companies and speculators who are jacking up rents and evicting so many small businesses and renters—and they are surely happy to stay out of the spotlight. Gentrification is a many-layered beast nurtured by cultural and economic trends, regional and local labor and housing factors, and public policies (or lack thereof). Beneath the surface-level aesthetics, it is about displacement of people who don’t fit the dominant economic growth plan—radical market-driven upheavals of communities often abetted by government policies and inaction. The stats are familiar but bear repeating as they are so destructive: average apartment rentals exceeding $2,700 a month, requiring someone making $70,000 a year to pay half of his or her salary in rent. Literally thousands of no-fault evictions in the past decade, according to the Rent Board. Despite rampant displacement of thousands of San Franciscans, there has been little response from City Hall: no hearings, no proactive legislation, not even bully-pulpit style leadership. We must demand more. Where is the leadership demanding the city do everything in its albeit limited power to halt further displacement of residents and small businesses? The toxic combo of tenant evictions and home foreclosures by the thousands — driven principally by major banks and real estate companies — is destroying lives and communities. Some of this is beyond City Hall’s jurisdiction: state laws like the Ellis Act and Costa-Hawkins enable no-fault evictions and prevent vitally needed commercial rent control. Still, beyond their valiant opposition to the Wiener-Farrell condo conversion threat, city leaders have been largely silent about this latest wave of gentrification that’s eviscerating communities, driving out small businesses, and squeezing renters to the bone. What can we do? We won’t defeat gentrification with city hearings or loud protests or online screeds and petitions — but we need all those things, along with serious public education, to shine a bright hot spotlight on the companies and individuals defining who lives and votes here. We need a new era of citywide awareness, unity, and action to literally save San Francisco — a bold unapologetic vision that puts affordability and diversity at the forefront of what our city is about. We can’t have diversity without affordability; it’s that simple. Renters are gearing up to fight back. An ‘Eviction Free Summer’ is being planned — an innovative campaign to counter the rash of evictions that are generating both displacement and skyrocketing rent prices. The idea of ‘Eviction Free Summer’ is to put evictions and evictors in the spotlight, to put would-be evictors on notice and capture the attention of city officials who have so far done little to stem their tide. We must demand accountability and action by City Hall and state legislators to rein in the real estate industry and put the brakes on evictions and other displacement. People’s lives, neighborhoods and communities, and the very fabric and identity of our city are at stake. To those who cheer “change” as if its victims were not real, or who wearily concede the fight, we must ask: are we really going to allow the profit-hungry market and wealth-seeking executives and speculators decide who lives and votes here? Are we going to let the market destroy what’s left of our city’s economic, cultural, racial and ethnic diversity — the very things that make San Francisco what it is? Sick of high-paid tech employees driving up rent prices, protestors in San Francisco’s Mission neighborhood held a “Anti-Gentrification Block Party” and beat on a Google bus piñata before cops broke up the crowd. The area has long been home to artists and Mexican-American families, but they’re being forced out as techies move in, their employers set up shuttle stops, and housing prices skyrocket. Mission district blog Uptown Almanac’s Kevin Montgomery was on the scene. He describes 30 to 40 people assembled at the neighborhood’s 16th street Bay Area Rapid Transit station. The spot is one of the dirtiest in the city — in stark contrast to fancy Valencia street just one block over where software engineers frequent posh restaurants and pricey bike shops. Google, Apple, and Facebook all have shuttle bus stops in the neighborhood making it easy for their employees to live in the hip district while commuting south to Silicon Valley in style. The buses have become a symbol of gentrification. Dozens of police officers surrounded the rally, fearing it might devolve into violence. Last May a riot broke out in neighborhood with many businesses vandalized with “Yuppies Out” graffiti. Montgomery says that around 2:30pm yesterday “the [protestors] did string up the piñata to a makeshift fishing pole and beat it mercilessly” as seen in the video below from YouTube user Krionni. Soon after, the police swarmed in and dispersed the group. As a three-year resident of the Mission, I’ve seen the influx of money from the rise of Apple and Google’s stock plus the Facebook IPO change its character. When the San Francisco Giants won the World Series, local techies came out to spectate and record the chaos with their iPads. Cheap grocery stores and eateries have been going out of business, while trendy bars and cafes move in. Rent increased 29% from 2011 to 2012 alone. Unfortunately, I’ve haven’t seen the tech giants who’ve colonized the neighborhood do much to give back. Funding some local education or beautification initiatives could go a long way to reducing the gentrification backlash. 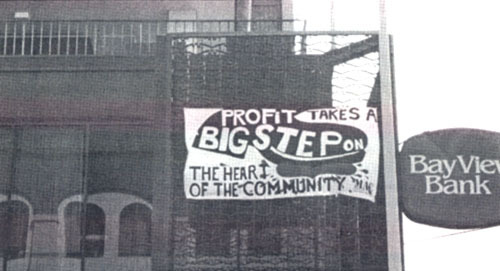 Key events in the anti-displacement movement in the Mission district of San Francisco in the late ’90s. Extracts from the full article. 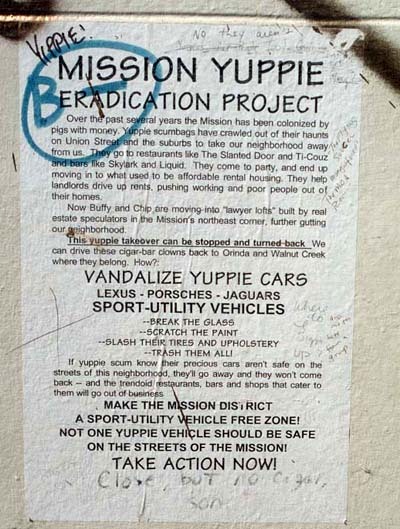 The posters of the Mission Yuppie Eradication Project (MYEP) was one of the visible signs of opposition in 1998. 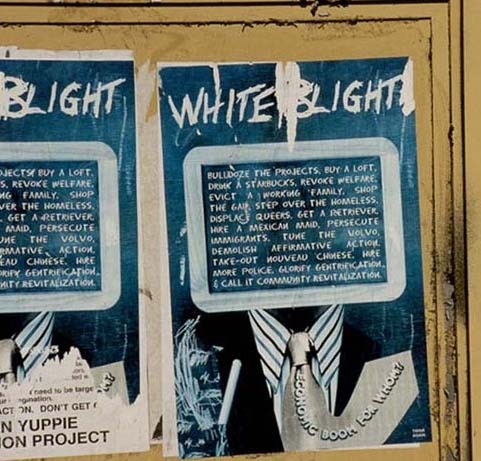 Below, left, we see the first of several posters MYEP — advocating vandalism of expensive cars — wheatpasted around the neighborhood. On the right, social commentary on an abandoned Mission district factory wall. Eikon Investments, the firm that proposed a dot-com office remake for the Mission Armory, staged a party for the Internet business set, served by white-coated parking valets, and addressed by Da Mayor. Activists from MAC and the Digital Workers Alliance crashed the party. The first influx of dot-com office development had been in the Northeast Mission Industrial Zone. 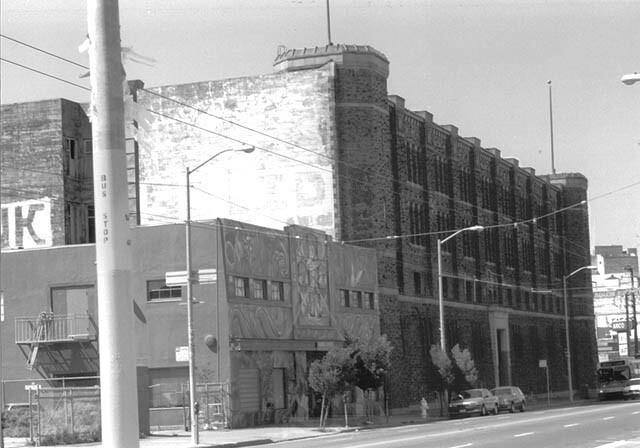 The Bay View Bank Building was the first major incursion into the heart of the Mission — the Mission Street corridor. The Mission Street and 24th Street corridors are the main commercial and cultural heart of the Latino community in San Francisco, and many of the small businesses in these commercial strips are marginal. For example, produce markets are a common site in the Mission. A study of these markets by MEDA showed that only 16% had enough revenue to qualify for mortgage capital to buy their buildings. This puts them at the mercy of the current rental market. The incursion of high tech firms into this commercial district threatens to drive rents through the sky, as landlords drool at the prospect of much higher revenue per square foot. The first major invasion of high-tech firms into the Mission was the takeover of three floors of the Bay View Bank Building by BigStep.Com — a firm that provides e-tailing services and tools for small businesses. The Cort family, who had bought the building, used asbestos abatement as the excuse to evict two dozen community serving entities from the building — immigration lawyers, nonprofits, etc. Luring BigStep.Com was the sign that the Corts needed that their strategy of “flipping” the building would work. MAC maintains, however, that this takeover is illegal. Zoning for Mission Street limits any one entity to no more than 6,000 square feet — the equivalent of one floor. This is to maintain the office space in the Mission for smaller community-serving entities. To “enforce the law” (which the Planning Department has failed to do), MAC activists occupied the offices of BigStep on Sept. 21st, to present their case directly to employees. About 20 activists were arrested by police. A banner was also draped on the outside the building (photo at right). Richard Marquez, left, and Renee Saucedo, speaking, are among the MAC members blockading the doors to Zing.com. At 11:30 AM Mission Anti-Displacement Coaltion members “moved in” at the live/work building illegally used as office space by Zing.Com (an online photography firm), at 17th & Bryant Streets. Furniture and padlocks were used to block all the entries to the building. After more than two hours Zing management finally signed a complaint and the police arrested a dozen MAC members blocking the doors. 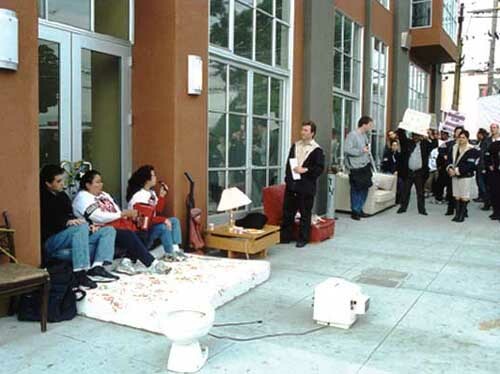 The blockaders were enthusiastically supported by over a hundred people from the Mission Anti-Displacment Coalition and the Day Laborers’ Program, which has its makeshift hiring hall one block away. As with the BigStep occupation, MAC was demanding that the city enforce existing laws. By converting a 48-unit live/work building to office space, the city loses out on the fees that office developers are required to pay for affordable housing and childcare, as well as losing the 48 units of housing.